How Does Chrysler's Pacifica Plug-In Hybrid Minivan Get 80 MPGe? Chrysler invented the mainstream minivan, but Honda and Toyota make much better ones. The 2017 Chrysler Pacifica Hybrid offers 80 MPGe with 30 miles of all-electric range. That’s better by far than anything Toyota or Honda can do. How did Chrysler beat them? The system, it’s worth pointing out, isn’t a bad one. The option of Level-II charging in roughly two hours with 30 miles of range is on par with most non-Tesla offerings. This isn’t the dinky hybrid system they offered on the Durango and Aspen, which were the company’s last meager attempts at a hybrid system. Nearly two years ago I sat down with Chrysler’s head of design Ralph Gilles, not as an interview just as a chat. After trying to talk him into putting the Hellcat into everything they make the conversation turned to minivans. How the hell would the new van compete with the better offerings from the Japanese? Gilles was convinced they would do it. “It’s our F-150,” he said, referring to the segment standard in trucks. My mind went to an attractive design or a lot of features, both of which the new van has. In no way did I expect Fiat Chrysler (FCA), which offers no other hybrid in their lineup, to come out with a high-tech hybrid option. Sorry, I take that back, one recently-FCA vehicle did have a hybrid system. The Ferrari LaFerrari was their only hybrid, but technically Ferrari isn’t part of FCA anymore. The company that made the system, Magneti Marelli, still is. It’s unclear if FCA kept it in the family and got MM to design the Pacifica’s new hybrid system or if Chrysler went somewhere else, but we’re asking. That’s not the “how” I really care about. Chrysler is an embarrassment from a technological standpoint and they haven’t seemed to care. How did someone convince CEO Sergio Marchionne to build something that not only helps them saves face but also serves a non-merged FCA into the future? The move could actually be genius, if you think about. Chrysler is the worst about building hybrid or electric vehicles and this has led to them buying emissions credits from Tesla, Honda, and Toyota. That means every year they have to write a check to their competition. While the overall minivan market is down, a lot of that is due to Chrysler shutting down production to get ready for the new van and Chrysler/Dodge still owns nearly half of the market. In 2014, the combined Town & Country and Caravan sales added up to 272,000 vehicles. 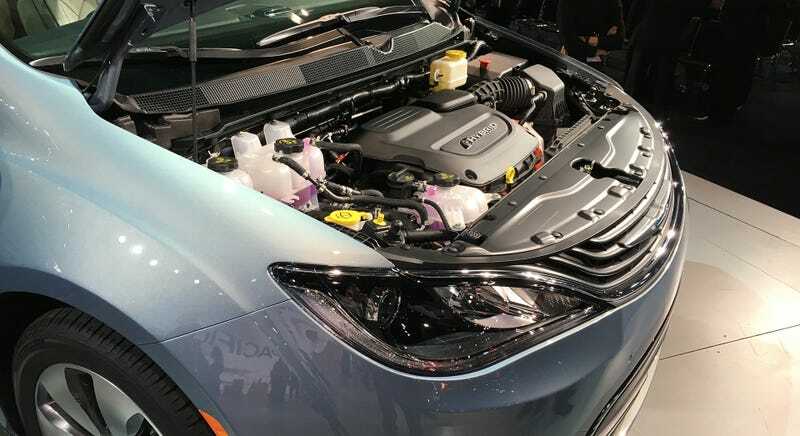 If Chrysler could repeat that with a vehicle that gets 80 MPGe in the city, that’s a huge win for them as they try to achieve increasingly stringent fuel economy standards.